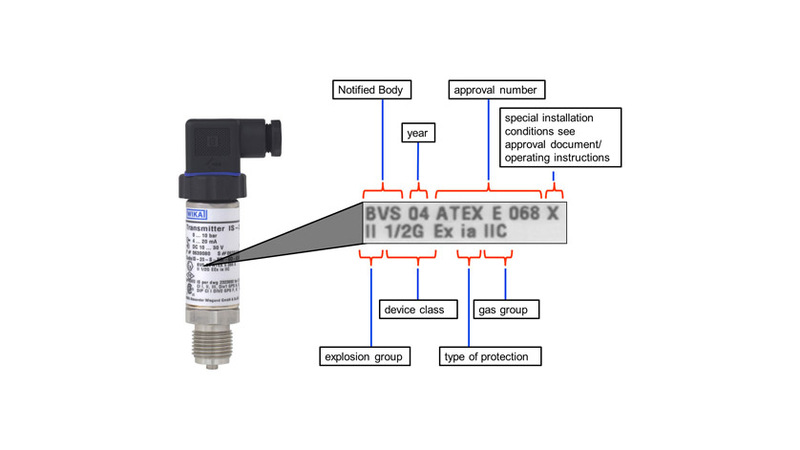 If pressure sensors, pressure transmitters and other field equipment are used in the vicinity of flammable gases or dust, they may be subject to marking in accordance with the ATEX product guideline 94/9/EC. ATEX requires the type label of the sensor to include the ATEX marking, so usually this is labelled directly onto the sensor during production. However, there are also devices where only certain parts may be installed in other zones, for example, a pressure sensor marked 1/2G may be installed in a tank with flammable content. The electronic part of the transmitter is located on the outside of the tank, and thus in zone 1.